Josh Dirda’s never wanted to be tied down before, preferring the emotional ease of the one night stand. But when Patrick moves into the apartment that Josh shares with three friends, Josh is pulled in by Patrick’s sly wit and quietly creative spirit. As Patrick’s self-appointed tour guide, Josh can be Patrick’s introduction to the city he loves. But after a drunken Halloween hook-up crosses lines, Patrick and Josh must reckon with their true feelings—and decide whether they can let go of the ghosts from their pasts that haunt them. I adore discovering new authors, especially when they deliver lovely stories like Natasha did with Calling Calling Calling Me. It was a surprise how much Patrick and Josh relationship engaged me. Although lately I had little free time to devote to my reading and it took me a long time to finish the novel, I found myself sucked into the MCs’ lives. And one more reason why I was surprised by how much I liked it, I am not a great fan of new adult love, I prefer my men to be more mature and I tend to avoid characters under 25. That said when a blurb is interesting I can’t say no. Maybe this is one of the rare times I actually loved both MCs, I don’t have a preference like always happens. Both Patrick and Josh were great, the author made an amazing job at defining them. I saw them with their friends, with their families, and I learnt how good they were. Their mums, Josh’s brother, so full of love and supportive. I liked all the interactions between them, I like the banters, the quarrels. These people made the story more complete and real, I truly felt them act like my own family does. And then there was the love story. Sure, Patrick and Josh found each other attractive from the first time they met, but this is not the usual lust/love at first time. They took their time to know what they want, from their futures and from this relationship, new not just to Patrick but to the experienced Josh too, finally ready to fall in love and stop jumping in bed with everyone. I loved how everything in their lives was different, nonethless Patrick and Josh were so tuned in together. I followed them through the first months of their love, and it was beautiful. At last, I want to add the book was really well done, well written and engaging, the reading flew easily and I will definetely keep my eyes open for more releases from this new author. I won’t miss them. The cover caught my attention from the start, it’s clean and fitting and I like all that blue of the sky. This entry was posted in Book Reviews, Books, Contemporary fiction, eBooks, LGBTQ Book Reviews, M/M Book Reviews, M/M Contemporary Fiction, M/M Fiction, M/M Romance, Uncategorized and tagged A Stella Recommended Story, A Stella Review: Calling Calling Calling Me by Natasha Washington, author Natasha Washington, Calling Calling Calling Me by Natasha Washington. 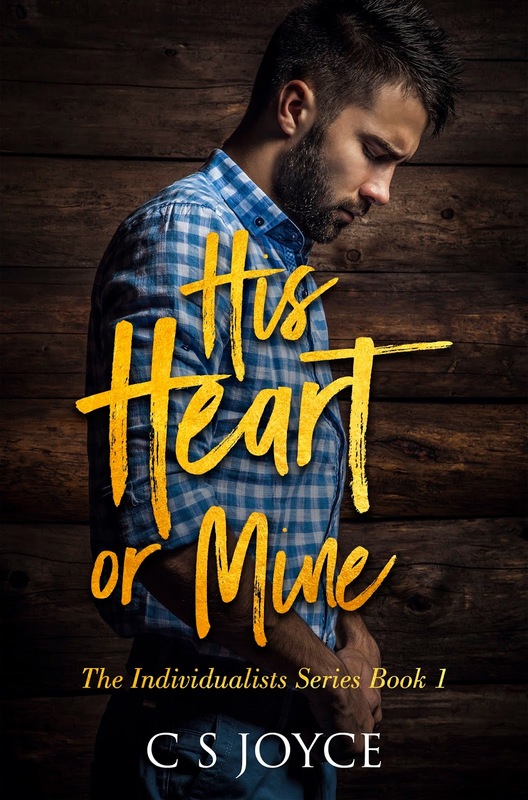 This entry was posted in Book Giveaways, Book Reviews, Book Tours and Contests, Books, Contemporary fiction, eBooks, LGBTQ Book Reviews, M/M Book Reviews, M/M Contemporary Fiction, M/M Fiction, M/M Romance, Uncategorized and tagged #newbookrelease #HisHeartorMine #giveaway, author C S Joyce, His Heart Or Mine (The Individualists Series #1)by C S Joyce, Signal Boost Promotions. It’s February 1985. Nick struggles to recover from a gunshot wound, while taking on the case of a woman with a mental illness, who may or may not have witnessed a murder. As he attempts to determine exactly what the woman saw and how much danger she may be in, he juggles the approaching DeCarlo trial, an ill Mrs. Harker, and the sexually precocious Terry. Valentine’s Day with boyfriend Joseph produces some big changes in their relationship. Life is evolving, but there’s no guarantee it’s for the better. I find it interesting how Marshall Thornton has written each book as almost as a mirror held up against the life (both inner reflections and daily outer living) of PI Nick Nowak. In some books the stories flow along with his struggles, both emotional and physical, occasionally ending up with some light and hope for Nick and the readers. But with Heart’s Desire (Boystown #11), the latest in this incredible series, the struggle gets darker, heavier for many around him, including his mother in law (sort of), his friend with HIV, even his building super. Oh, and himself, still fighting to recover from being shot It’s going very slowly.And Nick can’t understand why he’s physically not himself, including no sexual relations with his boyfriend. Joseph would like Nick to reject jobs that need surveillance, the very things have have gotten him injured. That’s not something that Nick thinks can he do, and while he’s thinking about his relationship and his health, a case comes his way in fhe form of his super’s sister who believes she’s seen a dead body and refuses to go back to her apartment. Should be easy excerpt that the sister has mental illness and there’s no body. A typical case for Nick because it’s convoluted, dark, and, connecting the dots for Nick manage to bring him up against people that impinge on other parts of his life. There are so many obligations and emotional strings tugging at Nick now. Mrs. Harker has terminal cancer and facing that and her role in his life is rough for Nick, equally so for Terry, the young student who spends most of his time with her and how has a “mature” boyfriend, another factor Nick and his friends are having issues with. Marshall Thornton threads all these incredibly complicated storylines through the novel and Nick’s life with such craft and such raw, gritty writing that the narrative and characters stick to your heart, making you think, making you hurt for them. And in this series and because we know the era and history, we fear for them. We know what they are dancing around…the elephant in the room. The tests that some haven’t or won’t take. AIDS. It’s the dark shadow that looms over Nick, his lover, and all his friends and any future they might have. Heart’s Desire (Boystown #11) by Marshall Thornton is a must read story in a must read series. I’m not sure how many the author plans. If he intends to finish the 80’s, because we are at 1985 now and he other series, Pinx Video, starts in the 1990’s. I want more and yet I fear what’s to come. I can’t recommend this story and series more highly enough! Cover art: Marshall Thornton. Works for branding the series and storyline. This entry was posted in 5 star Rating, Book Reviews, Books, eBooks, Historical, LGBTQ Book Reviews, M/M Book Reviews, M/M Fiction, M/M Romance, Uncategorized and tagged A MelanieM Highly Recommended Story, author Marshall Thornton, Boystown series by Marshall Thornton, Heart's Desire (Boystown #11) by Marshall Thornton, M/M Recent Historical Fiction. This was another fast paced installment of the Spectr series. This story picks up immediately after the last one ended. Caleb and Gray are in a bad situation and they’re on their own trying to stop Yuri and Dru. John is with his fellow agents and they’re working to control the violence and chaos spreading through the city. The story was pretty much action from beginning to end. A lot of things happen and this portion of the story comes to a close by the end of the book. The majority of the story is Spectr related but John, Caleb and Gray find some time for themselves, some time to repair the damage to their relationship. It’s only a small portion of the book but enough that things end with their relationship stable again. A new chapter in their lives will be beginning in Spectr 3 and I’m really looking forward to it. I think the way the author wrapped this up opens the door to many new adventures with these three. A must read for fans of this series. Cover: I love these new covers for this series. I think they are eye catching and will hopefully bring new fans to these books. I’m really glad the author decided to re-do these. This entry was posted in Books, eBooks, LGBTQ Book Reviews, M/M Book Reviews, M/M Fiction, M/M Paranormal Fiction, M/M Romance, M/M Supernatural Fiction, Uncategorized and tagged #5) by Jordan L. Hawk, An Ali Highly Recommended Novel, An Ali Review: Shaker of Earth (SPECTR Series 2, author Jordan L. Hawk, Shaker of Earth (SPECTR Series 2 #5) by Jordan L. Hawk, SPECTR Series 2 by Jordan L. Hawk. John Rookwood and Captain Cornelius Sheridan have been haunting the very Manor they died fighting over, two hundred and fifty years ago. On their death anniversary, a couple turns up to disturb their eternal rest and fantastically turn up to be related to the very pair. It soon becomes clear to the ghostly duo that thecouple harbours many misconceptions and in an effort to ensure their happily ever after they play into the gamble of manifesting themselves. But manifestation can take up a lot of energy, enough to wipe out a spirit from the spiritual plane and as the Captain seems in imminent danger of disappearing from all existence, John Rookwood is confronted by his feelings for his companion of the past two centuries. I don’t know how people feel about two ghosts getting it on but that is definitely something that is a part of this story, so you might want to confront your views on the same. The story has an interesting blurb but with some misguidance, it set up a very confusing introduction. It took a while for me to understand what was happening in the story and who all the characters were. By the time everything was in place and you know what is going on there isn’t much left in the way of plot, just a very elaborate scene featuring ghosts getting it on. I wasn’t wholly invested in any of the characters because it was hard to relate to them in any real way. The dialogue is very dated, the way our two main characters speak is awkward to the point that it was really funny and so very hard to take seriously. The dialogue might have been the most entertaining thing in this book but not in the way the authors intended. It is an okay, quick fun read with some heretofore never seen elements that were a little weird in their depiction. Cover Art by Cherith Vaughn. I really like the cover. This might be the only case of cover models actually resembling the characters they represent that made it one of the best cover. But, I must also commend the choice of background and text, especially the colour scheme and that hint of yellow is delectable. This entry was posted in Book Reviews, Books, eBooks, Historical, LGBTQ Book Reviews, M/M Book Reviews, M/M Fiction, M/M Paranormal Fiction, M/M Romance, Uncategorized and tagged A VVivacious Review: The Captain’s Ghostly Gamble by Catherine Curzon and Eleanor Harkstead, authors Catherine Curzon and Eleanor Harkstead, m/m historical fiction, Pride Publishing, The Captain’s Ghostly Gamble by Catherine Curzon and Eleanor Harkstead. Scattered Thoughts and Rogue Words is happy to host Andrew Grey today on tour with his new release All for You. Welcome, Andrew! Mostly in these guest posts, I try to say something original about the story that’s just releasing. But I didn’t want to do that with this one. See as I’m writing this post, I’m sitting in the writing room at home, listening to the rain. Normally I love the sound of the drops on the trees outside my open window, but its been raining for two days solid and I’m getting a little tired of it. Life is like that with a lot of things. When it hasn’t rained in a while, we hope for it, and then we want it to stop. Feast or famine is how it is with so much of life… at least for me. But there are some things I hope I can never feast enough on and I hope famine stays away forever. 1) Books – I can never get enough of them. 2) Story ideas – So far the well hasn’t run dry and I hope it never does. And the thought is famine is enough to… well let’s just not think about it. 3) My Husband Dominic – I think you all have enough of an imagination to know what I mean. After nearly 25 years together he;s still the center of my universe. 4) My fans – I love each of you and am grateful for every single reader. The only path to happiness is freedom: the freedom to live and love as the heart wants. Claiming that freedom will take all of the courage one young man has, but he won’t have to face it alone. In small, conservative Sierra Pines, California, Reverend Gabriel is the law. His son, Willy, follows his dictates, until he meets a man in Sacramento and reunites with him in his hometown—right under his father’s nose. Reggie is Sierra Pines’s newly appointed sheriff. His dedication to the job means not flaunting his sexuality, but when he sees Willy again, he can’t escape the feeling that they’re meant to be together. He’ll keep Willy’s secret until Willy is ready to let the world see who he really is. But if going up against the church and the townspeople isn’t enough, the perils of the work Reggie loves so much might mean the end of their romance before it even gets off the ground. “That’s great to know.” Reggie waited while the reverend looked to his left, and a man who had been sitting on one of the benches joined him. Willy. It was Willy from the bar. Reggie opened his mouth to say something when the reverend turned back to him. Willy looked even more scared than he had sitting at that table between the two rats. He was pale, his eyes downcast and his right hand shaking a little. Jesus, he was Reverend Gabriel’s son. Reggie was willing to bet that the reverend was not one of those new age, more enlightened men of the cloth. Somehow he didn’t think Reverend Gabriel had any sort of live-and-let-live attitude about gay people. “It’s good to meet you.” Reggie extended his hand, and Willy blinked, seeming to realize that his life wasn’t going to come to an end. “You too, sir.” They shook hands. “What do you do?” Reggie asked. William didn’t argue, but he didn’t agree either. “Have a good day, Sheriff.” Father and son left the station, and Reggie turned to the others, who were all watching him with wide eyes. One thing was for certain—no one was going to get away with bullying him. “I will, and there’s a call that just came in.” She handed him the details, and he got up and left the office, heading out to the scene of an apparent motorcycle race. This entry was posted in Book Reviews, Books, Contemporary fiction, Dreamspinner Press, eBooks, LGBTQ Book Reviews, M/M Book Reviews, M/M Contemporary Fiction, M/M Fiction, M/M Romance and tagged @andrewgreybooks #newbookrelease #AllforYou, @dreamspinners, A Dreamspinner Press Author Guest Tour, All for You by Andrew Grey, author Andrew Grey, gay fiction. Scattered Thoughts and Rogue Words is happy to host S. M. James today. Thank you for stopping by! Tell us a little about yourself and your writing goals. Yikes, yeah. It’s nerve-wracking stuff, especially as this book kicks off a 6-book series of stand alones PLUS their short stories. So we’ll see how that goes. That Feeling When is a dual POV YA, which alternates chapters between Landon and Archie as they figure out who they are, and how far they’ll go for love. As for a favourite character, I don’t think there’s any way to pick. I finished writing this book and actually missed these guys, which is one of the totally weird and wonderful things about being a writer. And now I’ve finished writing To Be Honest, I feel the same way about those guys. As for my favourite part, there’s a certain scene involving a camera, an audition, and a whole lot of trust, that really builds Archie and Landon’s relationship up to another level and was a lot of fun to write. It was great to see Archie finally let go of his insecurities. Noah Can’t Even by Simon James Green. Holy moly that book was hilarious and I seriously rec it everywhere I go. I can’t remember a book actually making me laugh out loud before—the situations Noah kept getting himself into just got more and more ridiculous. And the sequel lived up to it, which is always a great surprise. I need to reread this one soon. Does your research lead to bizarre internet searches? If so, tell us about some of your wackier searches, or ones that would make you nervous if your computer were ever confiscated by law enforcement. Heh, umm. You could say that. There have been bombs, automatic weapons, and disposing of bodies, because what else do characters in a fantasy novel need to know? For one of my genre novels I had to look up how long it took for a dead body to decompose, and there was this post about ‘Coffin births’ and DON’T LOOK IT UP because gross! So gross! (And if you did look it up, sorry to scar you for life but you were warned.) As you can tell, I’m still not past it. The most interesting thing I’ve researched for contemporary is anterograde amnesia. Some of the stories from people living with it were almost beyond comprehension. For my next novel, I’m continuing my research into Cystic Fibrosis and the impact it has on day to day life. Who would play the main characters in a movie about your book? Haha there’s a reason I don’t cast movies. I feel like I should have a Pinterest board for this kind of question but it is appallingly hard to find Aboriginal actors. I did watch an interview with Mark Coles Smith once, who may not look exactly like Landon, but had the same kind of boyish charm. For Archie, man, take your pick. Brenton Thwaites, Billy Unger, Nick Robertson. If they can manage surly and vulnerable, we’re good. (Five guesses what this is from). This entry was posted in Book Giveaways, Book Reviews, Book Tours and Contests, Books, Contemporary fiction, eBooks, LGBTQ Book Reviews, LGBTQ YA Fiction, M/M Book Reviews, M/M Contemporary Fiction, M/M Fiction, M/M Romance, Uncategorized and tagged #newbookrelease #ThatFeelingWhen #giveaway, @gaybookpromo, Author: S. M. James, contemporary romance, LGBT, Publisher: May Books, That Feeling When by S. M. James, YA.